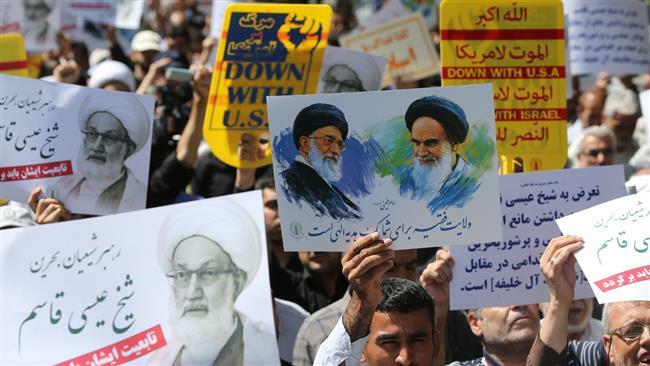 Iranians have staged demonstrations in the capital, Tehran, and several other major cities across the country to condemn the Saudi crimes and the Bahraini regime’s crackdown on dissent. The Iranian worshipers held major rallies across the country after Friday prayers to denounce the ongoing Saudi atrocities in the region. The demonstrators urged the so-called advocates of human rights to take practical measures to condemn the brutality of the Saudi and Bahraini regimes. During the demonstrations, which were held a few days to the first anniversary of a deadly crush during last year’s Hajj rituals in Mina, near the holy city of Mecca, the Iranian protesters also condemned Saudi rulers for failing to fulfill their responsibilities vis-a-vie Muslims during the annual rituals. The tragic Mina incident took place when two large masses of pilgrims converged at a crossroads during the symbolic ceremony of the stoning of Satan in Jamarat. More than 2,400 people, including at least 460 Iranian pilgrims, lost their lives in a stampede in Saudi Arabia on September 24, 2015. Saudi Arabia claims that nearly 770 people were killed in the incident. Iran has cancelled the participation of its pilgrims in this year’s Hajj rituals in September due to Saudi Arabia’s creation of obstacles in the way of Iranians seeking to perform the ritual. 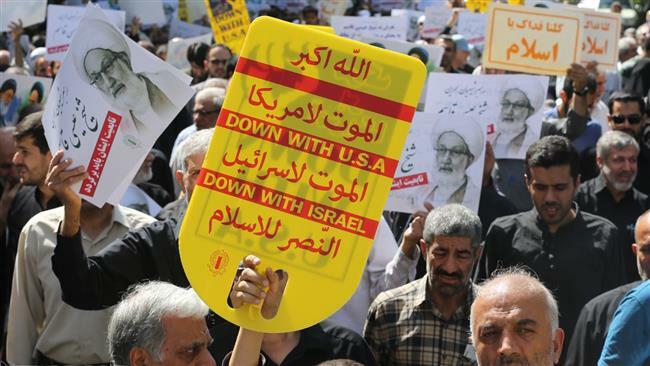 The Iranian demonstrators also carried placards and chanted slogans to protest against the Al Khalifah’s crackdown on Bahraini religious leaders. They expressed their support for the oppressed people of Bahrain and the country’s leading Shia cleric, Sheikh Isa Qassim, who recently had his nationality revoked by the Manama regime. On June 20, Bahraini authorities revoked the citizenship of Qassim less than a week after suspending the country’s main opposition bloc, the al-Wefaq National Islamic Society, and dissolving the Islamic Enlightenment Institution, founded by Sheikh Qassim, and the opposition al-Risala Islamic Association. 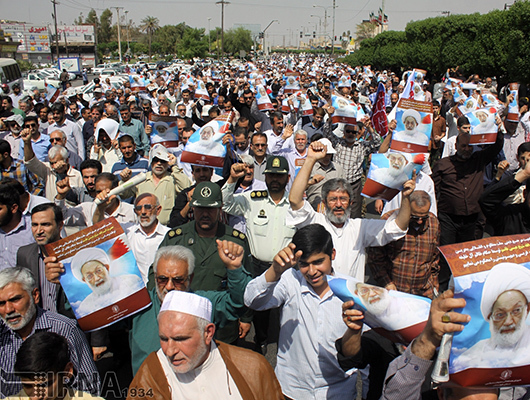 The Iranian demonstrators emphasized that they would strongly defend the high values of Islam and the Islamic Revolution. At the end of the rallies, the protesters issued a statement in condemnation of the Al Saud regime’s brutal acts against the oppressed Muslim people of Yemen and Syria, and the Al Khalifah’s crackdown on religious figures.